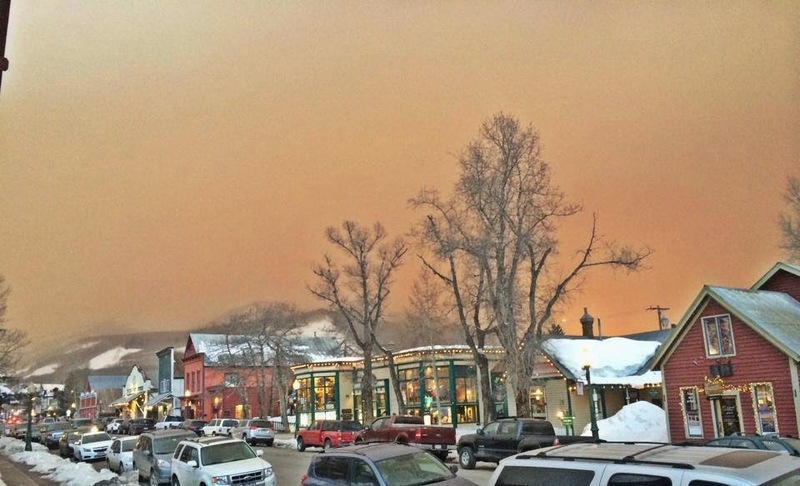 Yesterday, we got a brief and silty taste of the Dirty Thirties when a major dust storm blew over Crested Butte. Scarp Ridge recorded wind speeds of 110 mph (the highest of the season), and these winds brought with them a sizeable chunk of Moab. How will this dust on snow event affect snow stability and avalanches? Lets start with a key concept: albedo. Albedo is how reflective a surface is. White colors have a high albedo -- they reflect a high amount of radiation energy rather than absorb it. That is why you reach for a light colored T-shirt if you're going outside on a hot sunny day instead of a black T-shirt. Fresh snow has a very high albedo and it reflects most incoming solar energy. (So thats why my mom always made me double up on sunscreen when I went skiing!) On the other hand, the dark-colored dust more readily absorbs solar energy and heat, and also retains that heat longer. Pristine snow reflects radiation more effectively than dusty snow. Courtesy of Jeff Deems. 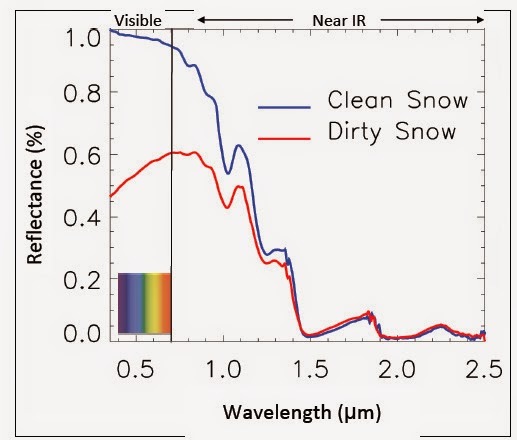 Dusty snow can absorb two or three times the solar energy of a clean snowpack. Whenever dust is near the surface of the snow (even when its buried up to a foot deep), it amplifies the rate of surface warming, increasing the amount of snowmelt and weakening the snow around it. This leads to more frequent loose wet avalanches. Intense melt rates send freewater deeper into the snowpack, which can also compromise the strength of deeply buried weak layers, causing an increased likelihood of wet slab avalanches. Both of these problems, with or without dust, can be avoided by monitoring how well the snowpack refreezes at night and getting off of slopes before they thaw too much. Dust on the snow simply shortens that window of stable snow and may prevent good overnight refreezes in some situations. Snirt. Snow+Dirt. Photo taken March 31, 2014 near Crested Butte. The second avalanche concern is that dust can do weird things when its buried by a slab of snow, and it can behave like a persistent weak layer. Because they absorb and retain heat longer, dust layers can cause wet grains above or below them to remain unfrozen and unstable longer. Dust can also cause tremendous temperature gradients in the surrounding layers, which causes the bordering snow around it to decay and facet. This is not always the case, but it is worth checking on how reactive dust layers are after they get buried by spring storms. It will be the easiest layer you will ever identify in a snowpit! The crown of a large slab avalanche that was remotely triggered from hundreds of yards away last spring. It failed on a dust layer. Sadly, dust on snow has negative impacts on the timing of spring runoff and water resources in the West. The Center for Snow and Avalanche Studies in Silverton, CO tracks and studies the effects of dust-on-snow events, and is a great resource for more information on this topic. On the bright side of things, your favorite mountain bike trails will melt out sooner now, and business is booming if you own a car-wash business.